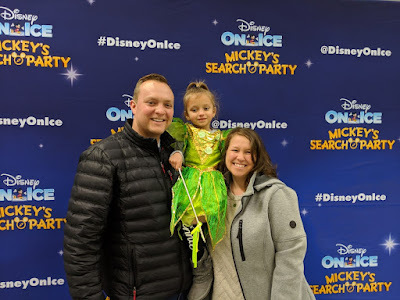 Dawn's uncle got her (and Dawn and me) tickets to Disney on Ice. 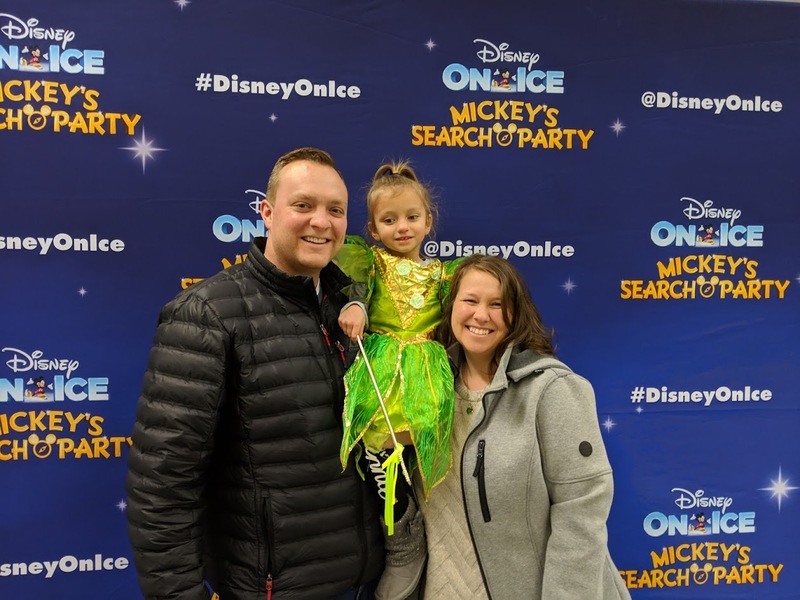 Summer was starting to feel under the weather, but she was SO excited when the characters came out on the ice. So much fun over the weekend. 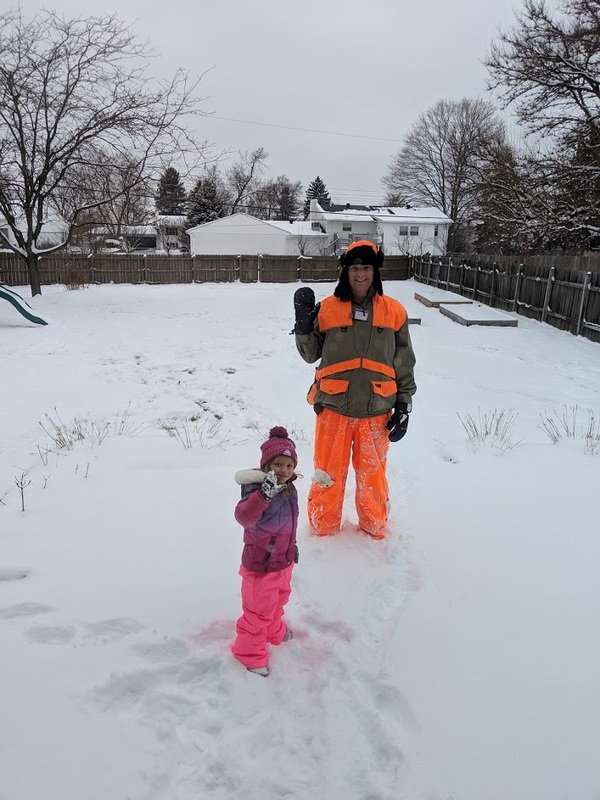 Summer and I had some fun in the snow as well. We would fill up the sled with snowballs and she said that they were gifts for all of her friends. Evan was loving life inside in his bouncer. 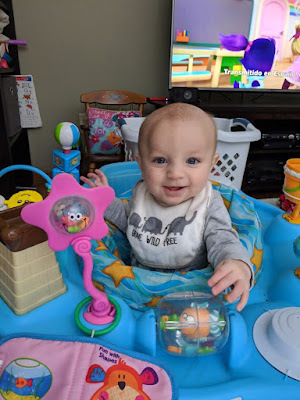 Summer liked the bouncer, but Evan LOVES it. I... love running in the snow.... Check out the snow all in my hair. I feel like a little kid when running in the snow. Fresh snow is fun,but packed snow can wear you out. 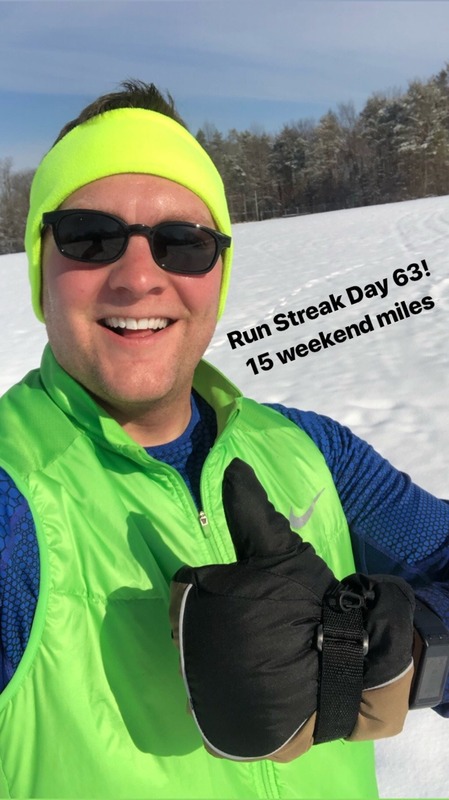 I did 6.5 miles on Saturday and it was fine, but the 8.5 miles on Sunday REALLY wore me out. 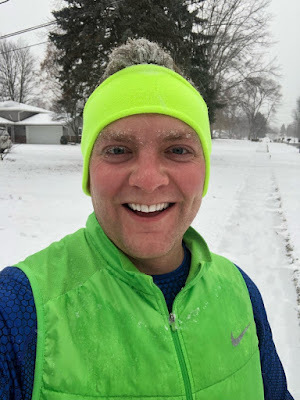 I did a 5k yesterday around my neighborhood, but I am going to cut back my miles the next few days to rest my strained muscles a little more. I figured you lose about 10-20% of energy with the slipping. All that depends on the shoes and traction. 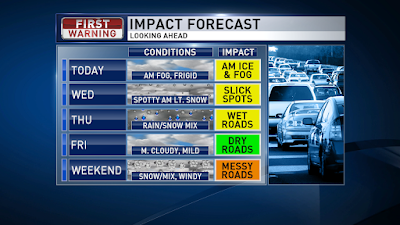 We have dense fog and frigid temps for your Tuesday morning, so use caution on the roads this morning for the potential for new icy spots. We will see a little sun once the fog clears then clouds fill back in for later today and highs near 32. More clouds tonight and spotty light snow by early Wednesday. We will generally see a dusting or half an inch for the areas seeing the spotty snow by midday Wednesday then mostly cloudy and highs in the mid 30s. A low pressure system over Colorado today will head our way for Thursday. 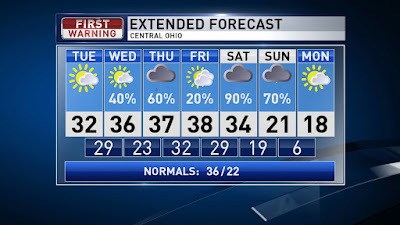 We will need to watch the temps closely because a couple of the forecast models are cold enough for the rain/snow line to set up along I-70 for Ohio. A couple other models are going about 2 degrees warmer and thus pushing that rain/snow line into Northern Ohio. Areas that stay all snow could see up to a couple inches of snow, but any rain will quickly cut down on any snow accumulation. 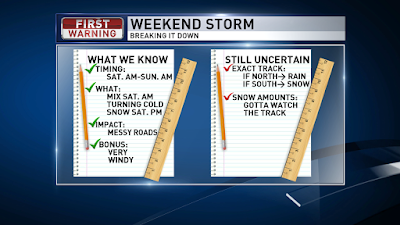 Stay tuned because just a slight temp difference could mean little to no snow, or enough to shovel. Timing looks to have the rain/snow arrive daybreak Thursday and move out to the east by Thursday evening. Friday looks quiet, mostly cloudy, and dry for the most part. Highs in the upper 30s. 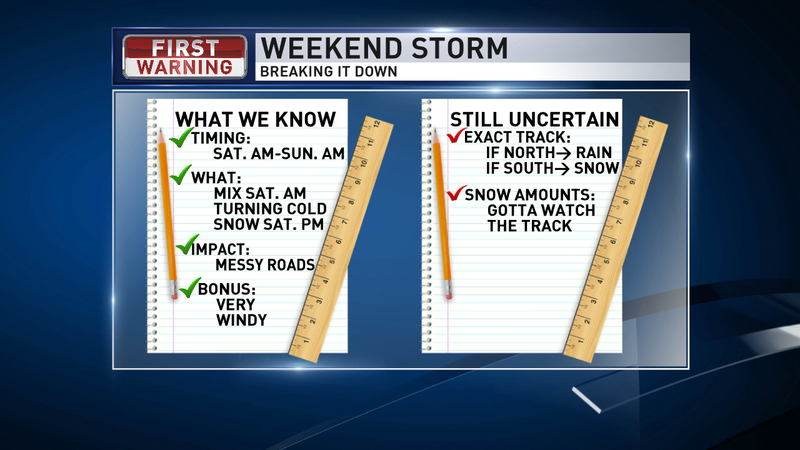 A stronger, more potent, low pressure system then moves in for Saturday and Sunday. It is currently on the Pacific Coast and will cross the Rockies over the coming days. Until it crosses the Rockies, the long-range forecast could still see adjustments from run to run. Right now most forecast models are agreeing that around daybreak we will see the precip start moving into Ohio. We will be on the rain/snow line again with this system with ice along that transition zone. Things may change, but this is what it is looking like on this Tuesday morning: Rain showers for Southern Ohio likely most of Saturday. The ice, or transition zone between the rain and snow, sets up most of the day along or just south of I-70. Then the northern parts of Ohio stay all snow with several inches of snow. By Saturday night colder air pushes in and we all transition over to another couple of inches of snow for the entire area with strong winds. A slight adjustment on trajectory or temps could greatly change this, so stay tuned. Snow showers likely on and off Sunday then MUCH colder air for Sunday into Monday. 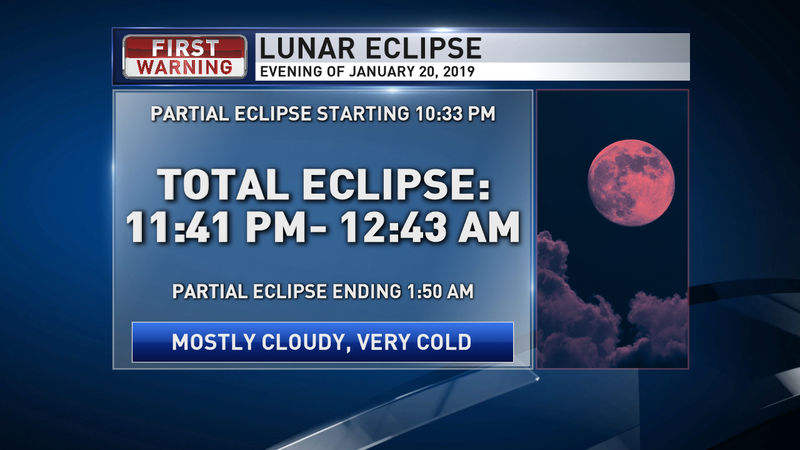 ALSO... Total lunar eclipse will happen Sunday evening. The total eclipse will happen between 11:41 PM Sunday and 12:43 AM Monday. 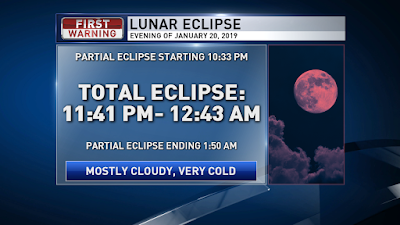 Fingers crossed that we can clear out some of the clouds because if we have clear skies then it will be viewable for all of Ohio. Have a good one!